No, your eyes do not deceive you. 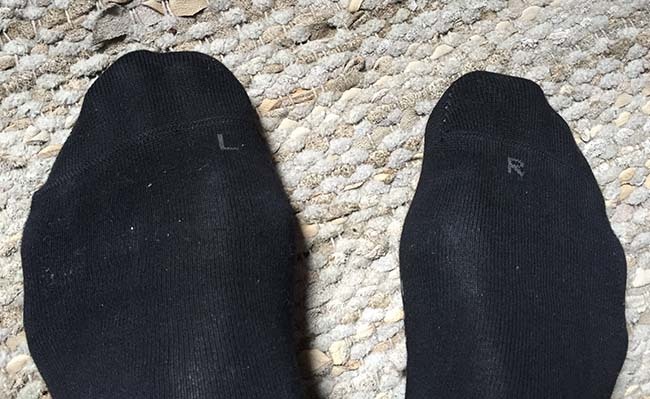 Those socks do say L for Left foot and R for Right foot…. and yes, they are quite different! How cool is that?….. And not only cool, but sooooooo comfortable. Now I must admit that I am currently susceptible to a good sock as I have suffered a number of sock issues recently. Rolling down under one’s foot for no apparently good reason, twisting themselves round so that the heel ends up on top of your foot, cutting so tightly into your leg to cut off blood flow and turn your foot blue – I am sure you have all been there at some point. But then, I have not been investing in socks – your local supermarket’s three packs for £5 (or was it five packs for £3) have their place but they could not be called Grande Luxe. So when the Webmaster suggested, on our recent trip to Berlin, that we should got to Falke, THE sock shop, I was there like shot. And what a shop…. Paradise for the feet created from a wealth of knowledge and experience. The first Falke, Franz Falke-Rohen, founded the first knitting mill in 1895 and over a hundred years later, Falkes (now Paul and Franz-Peter) are still running the show, although they have now expanded from just socks into hosiery, sports gear and goodness knows what else. If you are interested you can read all about their history here on the website. If you happen to be in Berlin you can visit this super classy shop on the super classy Kurfürstendamm. But you do not have to go to Berlin….. Just check in here to their on line shop and you will find the full range not just of socks, but of tights, ‘body wear’, sports gear and even a few accessories. But back to the nub – the socks…. The webmaster, who has done this before, went straight for the left and right feet jobs. Quite by chance, I managed to get some left and rights too – called Sensitive London (and, no, I have no idea why…) – 98% cotton and 2% elastacene with ‘non-constricting tops’. I haven’t actually put these through their paces yet – but I did wear the pair of Active Breeze ‘natural fibre blend’ as I tramped the streets of Berlin and, I tell you, it was a different world….. My feet still have not got over the delightful shock! ‘Dry feet thanks to a high level of moisture absorption, breathable material that guarantees freshness, supreme comfort thanks to soft and skin friendly lyocell fibres’…. Yes, it is all absolutely true! And the really good news is that, while they were quite pricey in Berlin, from their on line shop, they are quite reasonable – around £10 a pair for Sensitive London and only £8 a pair for Active Breeze! Yes, I know it is not five pairs for £3, but just think what you are getting…… So go treat yourself!! How very true. I spent years looking for socks that didn’t grip my calves like a vice and at the same time stayed up when you pulled them up. I had come to the conclusion that the two requirements were technologically incompatible until Falke entered my life. Its a minor miracle!